The DIB-443 "SIDEKICK" from Hosa is a passive direct injection transformer that changes guitar or bass signal to a low-impedance signal appropriate for sending down the snake to the house (or studio) mixing console's XLR inputs. An "INST/SPKR" switch, when placed in the SPKR position allows an amplifier's extension speaker output to drive the line, thus preserving the original amp sound. A Ground Lift switch breaks ground to help trouble-shoot and terminate 60Hz "ground-loop" hum. Since the DIB-443 is a passive device, no powering is required. 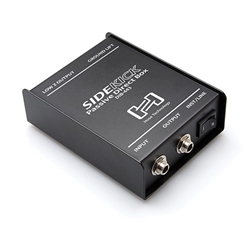 Allows for connecting a electric guitar or bass directly into a mixer without losing tone due to impedance mismatch, long cables or hum. Dimensions (WxDxH) 3 3/4" x 4 1/2" x 1 1/2"